Anger with an Angle: Is Your Child Using Anger to Control You? Have your child’s angry outbursts worn you down so much that you’ve simply learned to give in? 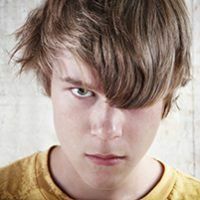 You should know that this is not a phase or a behavior that will “just go away on its own.” Read on to discover 5 things you can do to stop your child from using “Anger with an Angle” today. Anger is a fact of life. Everyone gets angry, including kids—they get frustrated and disappointed just like adults do. The goal for children as they mature is to learn ways to manage their anger or, as I like to say, “Solve the problem of anger.” That’s because anger is a problem—it’s not just a feeling. And like many other problems, kids solve it in different ways. Some learn to solve the problem of anger by developing skills like communication and compromise, while other kids deal with it by becoming more defiant and engaging in power struggles. You will soon see your child’s behavior escalate until you give in. That’s when anger and acting out do become premeditated. As children grow up, most learn to manage their anger. Each time they experience new situations, they begin to draw on the skills they learned previously. Most kids learn that temper tantrums don’t work—that yelling will not help their situation and that hurting someone or breaking something will cause them more trouble in the long run. But other kids go a whole different direction and practice a thing I call “Anger with an Angle.” They learn at a very early age that if they get angry and act out—or threaten to do so—the people around them will give in. In effect, they’ve learned how to blackmail their parents to give them what they want. If you were an outsider observing a child who uses “Anger with an Angle” you’d see him look as if he’s losing control. But what’s really going on is that this child is getting more and more control over his parents. He looks like he’s losing control, when in fact, he’s gaining control. And that’s the dangerous thing. The fact is, a child’s behavior won’t change until he’s not able to get power from it anymore. And certainly for a kid, control is power. As long as he gets power from that behavior, he’s going to continue to act out. As an infant, a child’s behavior is certainly not premeditated. But as kids develop, if they see that they get their way by throwing a tantrum or threatening to get angry, they will keep doing it until they’ve trained their parents to give them what they want. And many times, parents don’t recognize what’s happening. It’s a natural progression that leaves families frustrated and overwhelmed by the time their child hits elementary school. If you’re in this situation with your child, you will soon see his behavior escalate until you give in. That’s when anger and acting out do become premeditated. When your child is using “Anger with an Angle,” he’ll look like he’s going to take you right to the brink. He’ll act like he’s going to throw a temper tantrum in the store. And then you have a choice: deal with that temper tantrum or buy him a candy bar. Most parents buy the candy bar, which increases the probability this behavior will occur again. I understand why parents give in. They reason, “Well, it’s only a candy bar.” And I agree: I’ve got nothing against buying things for kids. But the bottom line is, how does your child go about getting that candy bar or comic book? Does he earn it with good behavior or buy it with his own allowance money? Or does he intimidate and bully you into giving in to him? If he’s doing the latter, you will probably see him act out in restaurants and other public places as well when he doesn’t get his way. At home, he will threaten to have a tantrum or lose his temper to get more power over you. This is “Anger with an Angle.” Make no mistake, kids use it to solve their social problems and dictate to their parents. By the way, you’ll often see a child who uses Anger with an Angle go to school and do the same thing. That’s because this has become his primary way of dealing with problems. You’ll see him play brinkmanship; he’ll continually take all the adults in his life to the edge; it becomes his main coping skill. And when that doesn’t work, he’ll just act out. In this way, he keeps the threat of blackmail alive. In my experience working with families, this problem just keeps getting bigger and more explosive as kids grow up. And by the way, some kids use “Anger with an Angle” by shutting down. For example, your teenage daughter may stop talking to you until you give in to her demands. If you give her what she wants, this ultimately gives her more control. Either way, if you let your child’s behavior control the situation instead of following your own parenting values, then you’re going to have a serious problem both now and as your child gets older. If your child has been using “Anger with an Angle” in your family, I think you and your spouse have to come up with a clearly defined plan of how you’re going to deal with this behavior. That plan has to include teaching your child other ways to solve the problem of anger besides intimidating you or misbehaving. The plan should also include how you will teach him other ways to solve the problem of not getting his way instead of manipulating you and taking it out on you and other family members. I think that people have to deal with acting-out behavior in an organized way. You need to take away the power associated with the threat of your child acting out. Know that whether he acts out in the supermarket, your living room or a restaurant, you can learn a way to deal with that. Here are some of the things I recommend you do when your child is employing “Anger with an Angle” in your family. As a parent, learn to ask yourself, “What’s the worst that can happen if my child acts out?” If you determine that you can live with whatever happens, then you can move on to the next step. So ask yourself, “What’s the worst that’s going to happen if my child acts out in the supermarket?” Insulate yourself from real risk. If the worst that could happen is your child will run onto the highway, that’s too much to risk for that situation. But if the worst that can happen is that he’ll lie on the floor and kick his feet, let him go at it. I always recommend that parents bring a magazine or a book with them when they take their child in public. Have a seat and let your child scream away. It may be embarrassing for those few minutes it’s happening, but your indifference will eventually teach your child that his acting-out behavior does not control you any longer. 2. Decide What You’ll Do Ahead of Time: If your child frequently acts out in public or at home, plan what you’ll do before the anger and intimidation start. Will you leave the room, or tell him that he’ll have consequences for his behavior? Decide what you’ll do ahead of time. Try your best to speak clearly and calmly when your child is having a tantrum. Do not get into a power struggle with your child over whatever it is he’s trying to use anger to accomplish. 3. The Aftermath: Talk to Your Child about What Happened: After the incident, briefly discuss what happened with your child so he can learn skills that will help him deal with the situation differently next time. If you don’t do this, know that his behavior is not going to become extinct on its own. In most cases, it builds on itself over time. Remember, every time your child acts out over something he wants, a couple of things are happening. He’s not learning to deal with his own urges. He’s not learning how to manage immediate gratification. He’s not learning how to get something appropriately if he wants it. Acting out becomes his only problem-solving skill—his only way of getting things. Your child doesn’t need to learn to understand his feelings; he needs to learn that when he gets angry, he makes choices. From now on, he has to learn how to make more choices that are positive. He also needs to learn ways of behaving that don’t get him into trouble. 5. Should You Give Consequences for Losing Control? The first thing you have to determine is whether your child is actually losing control or if he’s simply giving you cues and signs as a warning to give in to him. If the latter is the case, consequences are very much indicated. Many people will tell you not to give your child a consequence for acting out of control or throwing a tantrum. They reason that if the child loses control he shouldn’t be held responsible for his actions since he’s not actually making choices. In my opinion, if your child loses control once or twice, you may want to hold off on consequences. But if losing control becomes a pattern–if this is how he deals with things on a regular basis—I think there should definitely be a consequence. His behavior both inconveniences others and might even put your child or others in danger. Let’s say you’re supposed to be getting home to your other kids, but your child is acting out at the mall, so you have to call a neighbor to run to your house. Your child’s behavior has now put everyone else at risk. If your child acts out in the car, he puts you and everyone else there in danger. I think there should absolutely be consequences for that behavior. Don’t pussyfoot around and let your child off the hook with “Oh, he lost control.” That’s exactly how he’s working you. His angle is, “I lost control—I couldn’t help it.” Many parents get suckered in by that excuse. But I would tell you that if this acting out happens more than once in a while, your child should be held accountable and there should be consequences. 6. What is Your Parenting Style? Let’s go back to the supermarket example. You see your child start to deteriorate—what do you do? When you use the Coaching style of parenting, you’d say something like, “Remember, we talked about this and you told me that the next time you were upset at the store, you would go over and read magazines until you calmed down.” Your child may not do it, but keep coaching him. Eventually, he’s going to respond appropriately. Believe me, behaviors for which people are held accountable and receive consequences tend to diminish over time. Conversely, behaviors that are rewarded tend to increase. It’s just that simple: if you reward the acting out or the threat of the tantrum, it’s never going to go away. A child who’s blackmailing you with temper tantrums over a candy bar in the supermarket today is the same kid who’s going to stay out all night when he doesn’t get his way. And sadly, you won’t be able to stop him. The next time he says, “Well, if you let me stay out until midnight, I won’t have to stay out all night,” you’ll give in because you’re scared of what might happen if you don’t compromise. But again, I think you have to decide: “What’s the worst that could happen if I don’t let my child manipulate me?” Will your child’s behavior escalate when you start to deal with it? Yes, it will. But I think the more guidance and support you have, the better you’ll be able to manage. 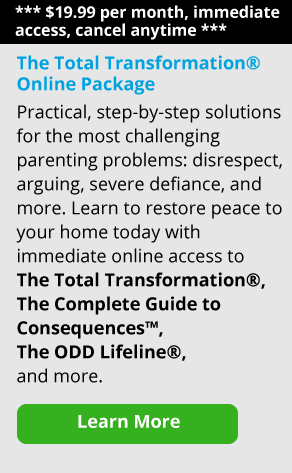 Believe me, if your child isn’t taught these all-important problem-solving skills when he’s young, he’s at a higher risk of spending his adult life going from medication to medication, or maybe getting into some kind of social/criminal trouble. If he’s lucky, he might come to grips with his self-defeating strategies and his lack of appropriate problem-solving skills through some sort of educational or therapeutic process. This usually occurs after many failures and disappointments. As a parent, I want you to know that you have the power to help him face his problems now.